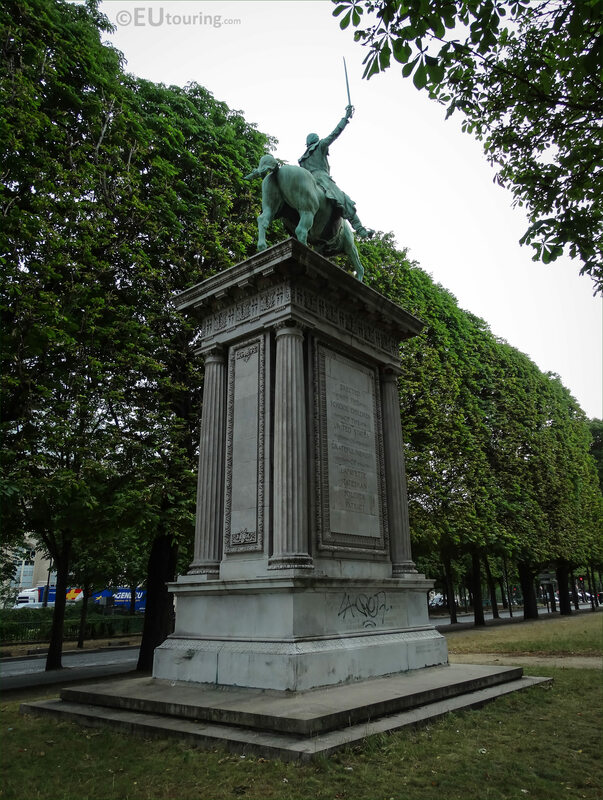 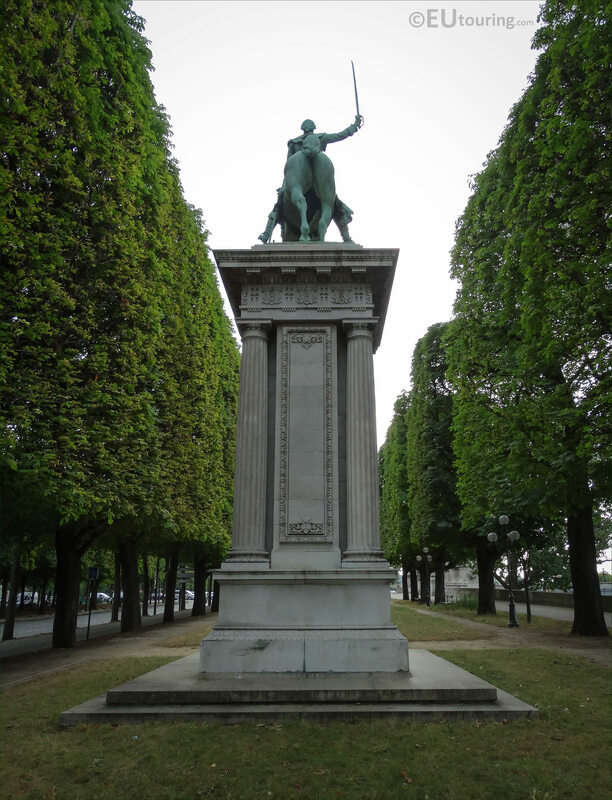 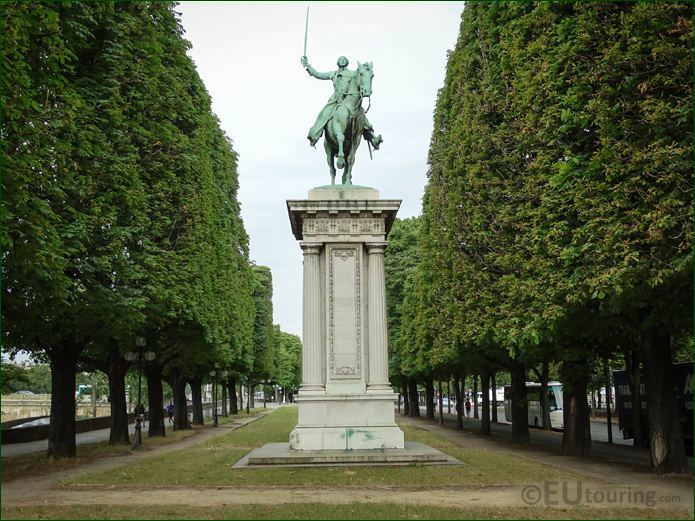 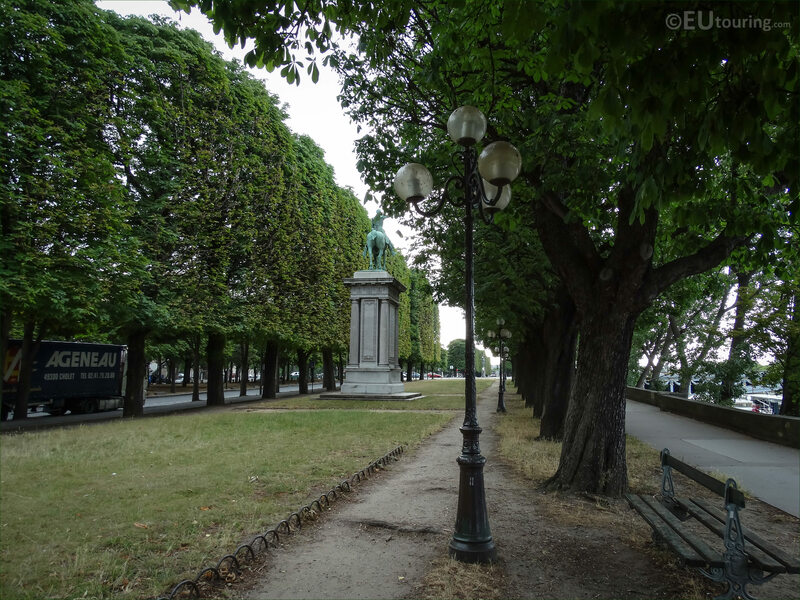 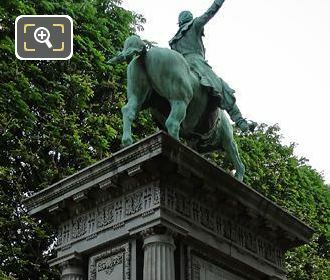 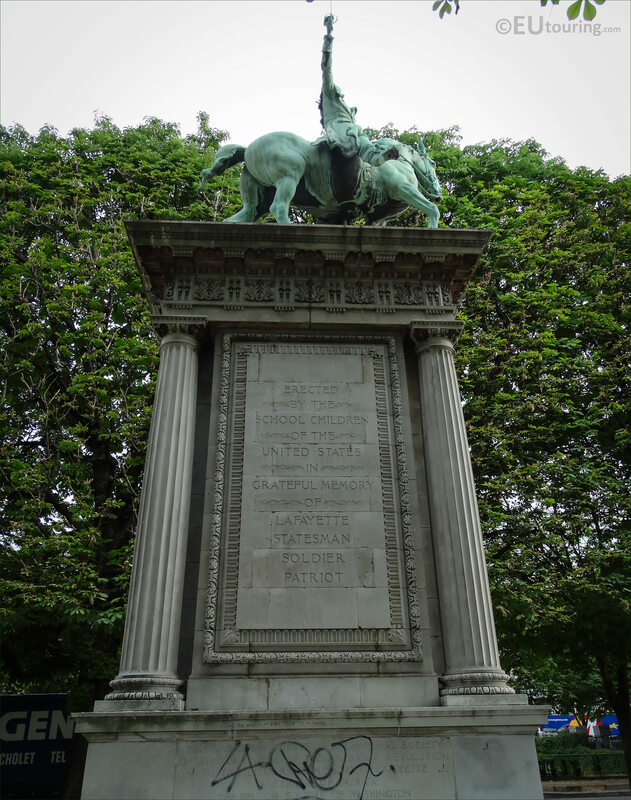 We were walking along the Cours la Reine in the 8th Arrondissement when we took these high definition photos showing the Monument to Lafayette, which was designed by the architect Thomas Hastings and the equestrian statue was produced by the sculptor Paul W Bartlett. This first HD photo shows the equestrian statue of Lafayette, which is made of bronze and stands on a tall pedestal, making this a total height of 6.4 metres, and located along the Cours la Reine bordered by trees, you have the River Seine on one side and the Grand Palais on the other side, which would be to the right of the image. 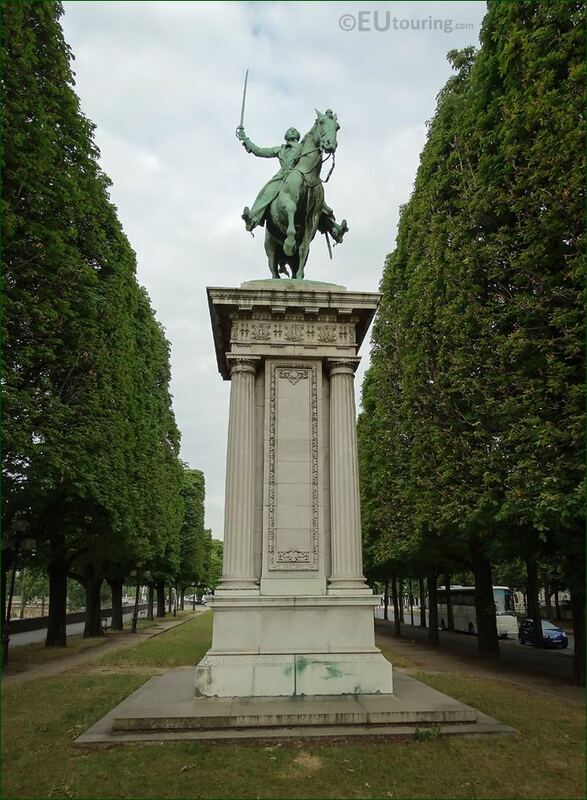 Now this Monument to Lafayette was originally instigated by an American from Chicago called Robert J Thomson back in 1898, and after the approval by the French government he set up a subscription to raise funds through US school children for the Lafayette memorial, which totalled 50,000 Dollars. 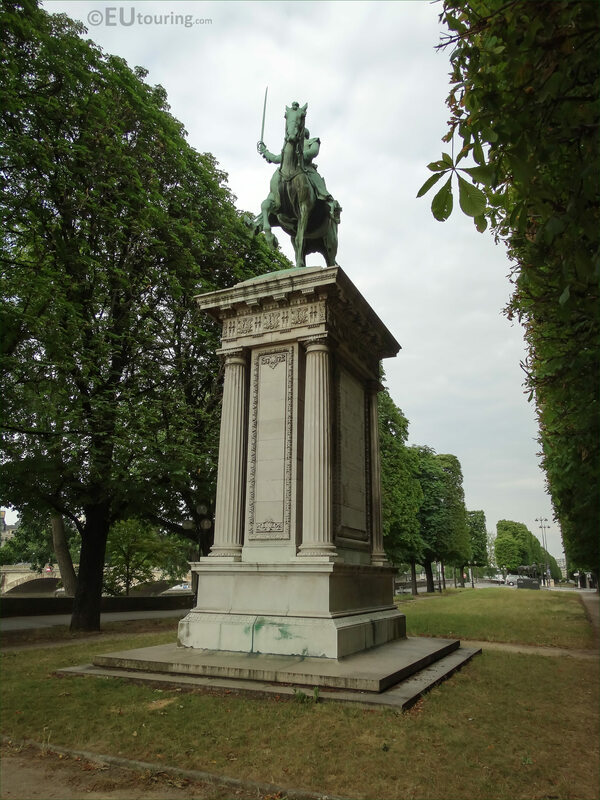 So, in 1899 the American born sculptor from Connecticut, Paul Wayland Bartlett, who had moved to Paris with his father at the age of nine and ended up studying sculpture under Emmanuel Fremiet, was chosen to produce the bronze equestrian statue of Lafayett. 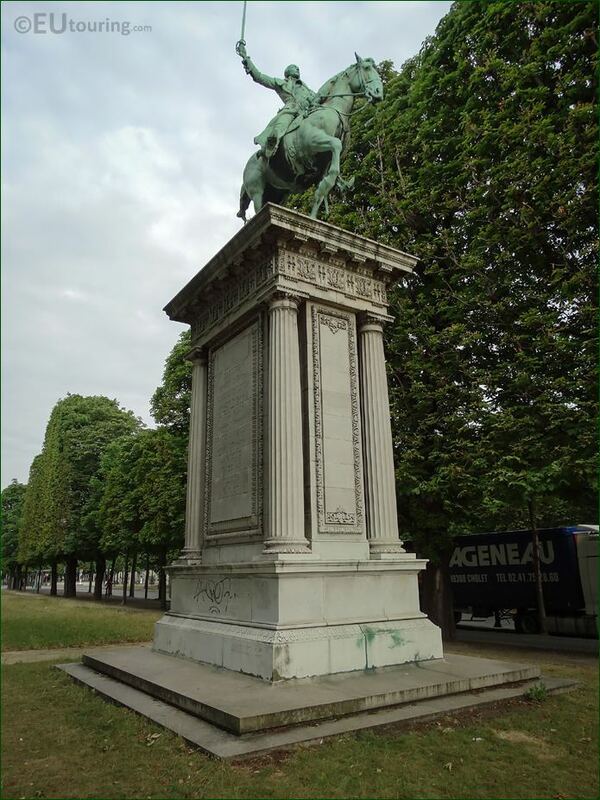 Initially Paul W Bartlett produced a patented plaster model, which was unveiled at the Cour Napoleon courtyard of the Musee du Louvre on American Independence day, being 4th July, and this was put in place in the year 1900 temporarily due to the fact that the bronze version was not ready. 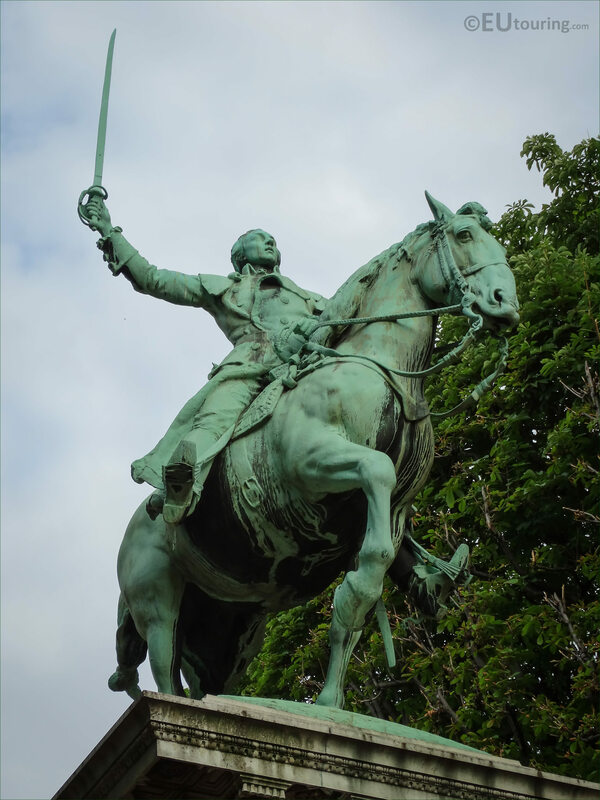 However, when the original plaster model was unveiled in the presence of the great grandson of Lafayette, the sculptor was not happy with the outcome and having Lafayette portrayed wearing a wig and a tricorn, which is a type of hat that was popular in the 18th centiury. 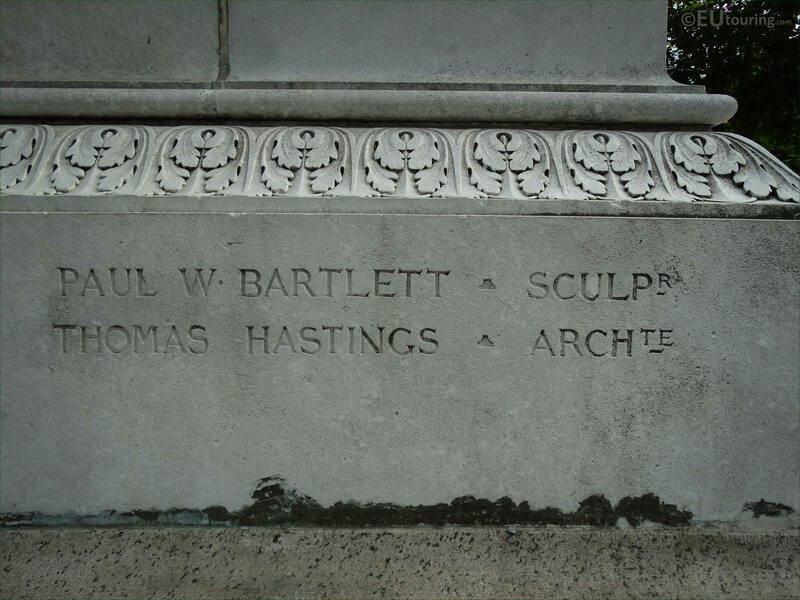 Therefore Paul W Bartlett, often referred to as a French sculptor due to the fact that he lived in France for the majority of his life and passed away in Paris in 1925, set about producing a different variation of the memorial monument in different attire to the Louis XVI style costume of the original plaster model, which he worked on from 1900 through to 1907. 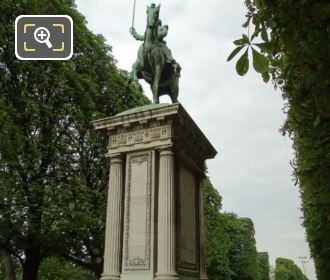 Eventually, the bronze equestrian statue on top of the tall pedestal that you can see in this HD photo, which was designed by the American architect Thomas Hastings who was born in New York City, was unveiled in the Cour Napoleon of the Musee du Louvre in the June of 1908, but without a hat and Lafayette wearing different clothes, and this is where it remained until 1984. 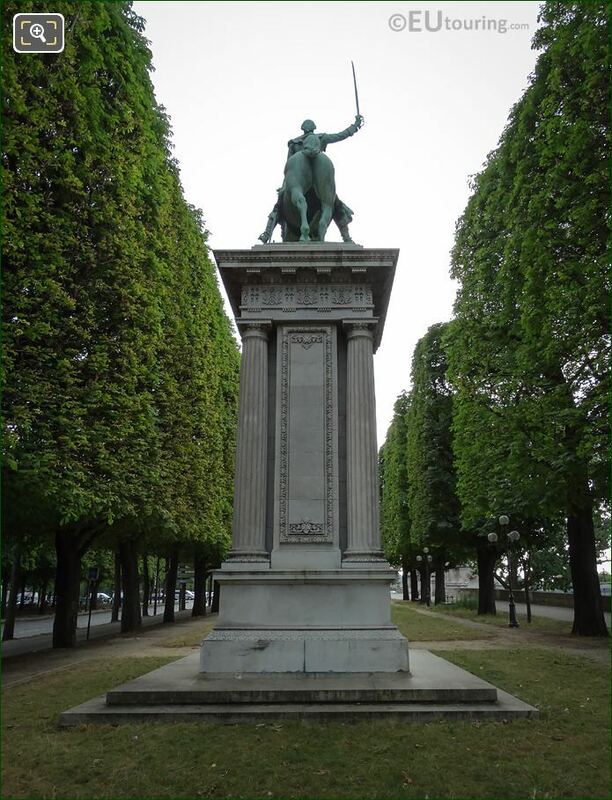 In fact it was when the courtyard had archaeological excavation prior to the erection of the I M Pei pyramid as the new main entrance to the Louvre museum, that the Monument to Lafayette was moved to its current location along the Cours la Reine in the 8th Arrondissement of Paris facing towards its original location and the Place de la Concorde. 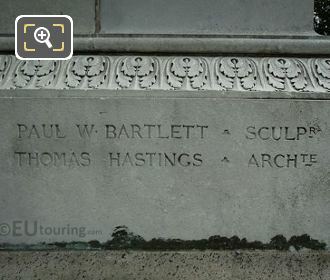 And here you can see a close up we took showing the names of the sculptor, Paul W Bartlett and the architect Thomas Hastings, which is located on the lower plinth of the pedestal in recognition of the two Americans that made this Monument to Lafayette possible. 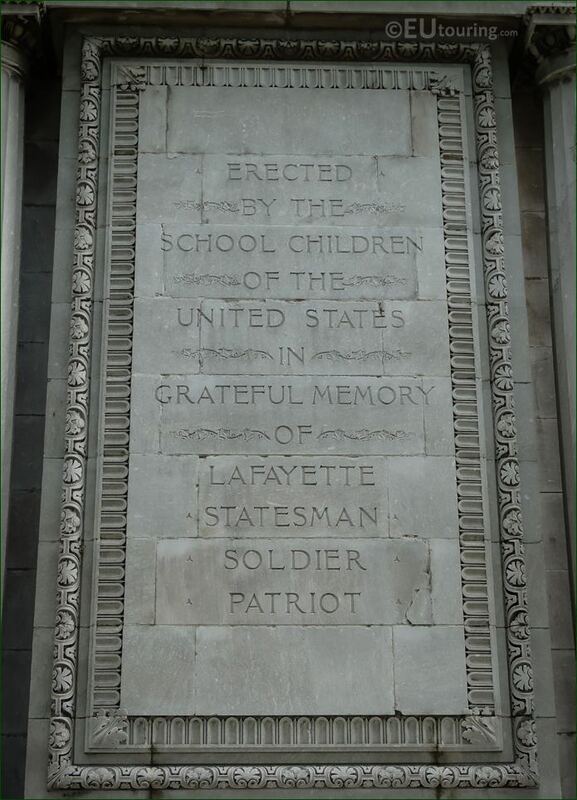 Erected by students of the United States schools in grateful memory of the Lafayette statesman, warrior, patriot. Erected by the school children of the United States in grateful memory of Lafayette, Statesman, Soldier, Patriot. And although Lafayette was born in the Auvergne region of France, he was dedicated to the American cause, fighting for America and is classed as a hero in the US. This image shows the enormous size of the monument dedicated to the memory of Lafayette, who was born Marie-Joseph Paul Yves Roch Gilbert du Motier, Marquis de Lafayette in the September of 1757 and became a French military officer fighting in the American Revolutionary War, and he became a close friend of George Washington and Thomas Jefferson. 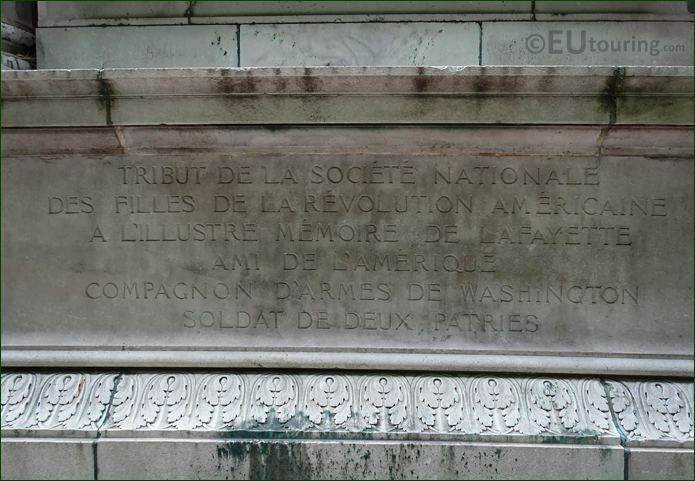 Tribute of the National Society of the Daughters of the American Revolution. 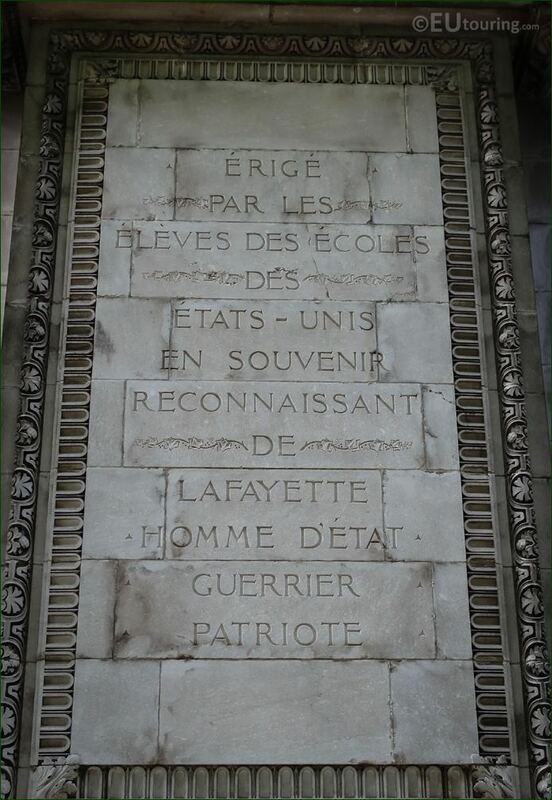 A memory of the illustrious Lafayette friend of America. 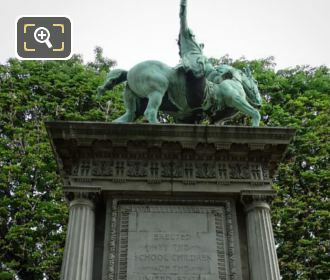 Comrade of Washington soldier of two homelands. 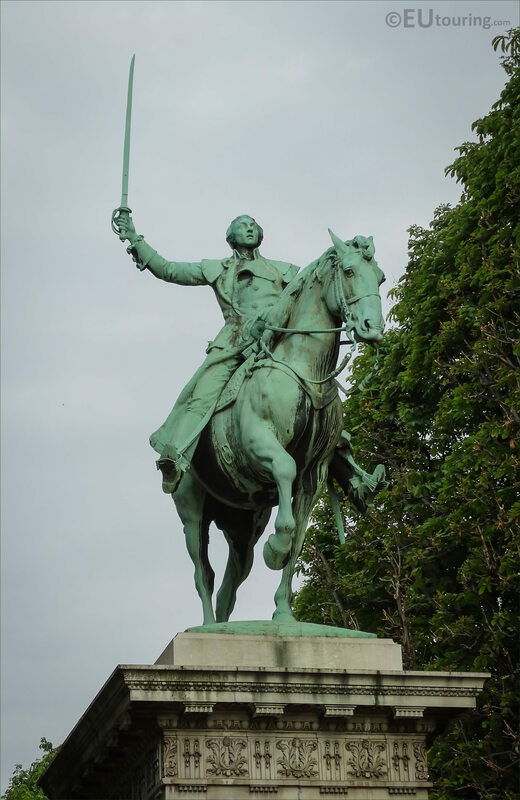 And General Lafayette, often just known as Lafayette, was deemed an American hero who also has a nickname of Hero of the Two Worlds, and one of the many things that he is recognised for, is helping to write the Declaration of the Rights of Man and of the Citizen, with the assistance of Thomas Jefferson, which in French is Declaration des droits de l'homme et du citoyen.